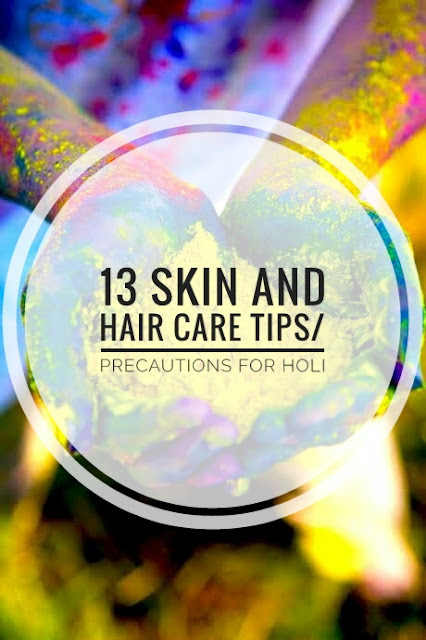 13 Skin and Hair Care Tips/Precautions for HOLI - YOUR FANCY SELF! Holi is one of the most fun festival of India. With all the fun and colours comes, the worst after effects. It is the time when our skin gets ripped off its natural oils and texture because of the chemicals in the holi colours. The hair gets more dry and damaged. The skin gets stained for a good 4-5 days. Owing to all these effects, it is better to use organic and natural colours. But if you can't help yourself from using those bright chemical based holi colours. Also avoid using colours like purple, blue and green as they have more chemicals. Here are 13 tips/precautions you need to take to protect your skin and hair from damage. Before stepping out, wash your face with cold water and use a toner specifically pore shrinking, so that the colour does not seep into the deeper layers of your skin. Following the toner, apply a good amount of Sunscreen SPF 50 or higher half an hour before stepping out on your face and body under exposure. This is one of the most important step to prevent a tan and damage to your skin owing to the sun exposure and holi colours. Use a thick layer of moisturizer over your sunscreen on your face and body, so that the colour does not stick to your skin and seep into the skin. You can also use good amount of oil in place of the moisturizer to your face and body so that colour slips from your skin. You can use coconut oil, olive oil, castor oil or mustard oil depending on you choice. You can also apply vaseline to your ears so that the colour does not stain the pinna of your ear. Paint you nails with a dark colour nail polish to prevent them from staining. Using 2 coats of nail polish is suggested. You can also paint a little outside you nails on the skin and cuticles so that the sensitive skin around the nails does not get damaged and stained. Oiling is not just meant for the skin, apply generous amount of oil (mentioned above) to your hair too in order to protect them from the damage of colours. Try oiling your roots when so that the scalp does not take the stain of colours and get damaged. It a must to tie your hair in a braid, ponytail or braid. Though I recommend that if your hair are already dry and frizzy, do cover your head with a Bandanna, cap or scarf. This will protect your hair from getting more dry and damaged. Protect your lips by applying a lip balm or vaseline generously. My tip is to apply a sticky lip gloss as the water or colour would just slip away from it. Tops with long sleeves and bottoms with full lengths are recommended , so that most of your skin is covered from exposure to sun and the colours. Clothes should not be too tight or synthetic material as they will retain coloured water for longer and stain your skin. Rather it is recommended to wear dark, loose and clothes that do not retain much water like cotton fabric. Do not wear contact lenses what so ever as you are most likely to damage your eye and lenses if the colour goes into your eyes. Splash your eyes with cold water in case you get some colour in your eyes. After playing holi, do not sit in direct sunlight to dry up yourself or in any other case, as sun only intensifies the effect of those damaging chemicals on your skin and hair. It also makes it harder to remove them later. Basically sun bakes you and the colour! LOL! I hope you all find this helpful and follow these to protect yourself from the damaging effects of colours. The next post would be how to get rid of these stubborn colours and help your skin and hair revive. Do comment and share if you find this helpful. I am no way an expert or skin specialist. The tips which are put together, are either the ones I use personally or they have been researched upon by me from various trustworthy sources. Kindly consult your dermatologist in advance if you have serious allergies/sensitive skin before using any chemical based colours.